These M8 extension cables are a great fit with Omega's M8 style RTD sensors. The standard socket style 3-position connector connects with the plug style connector supplied on Omega's M8 style RTD sensors. The flying leads on the other end of the cable can be connected directly to a barrier strip style connection point, or use one of our various connector to conect to your instrument. 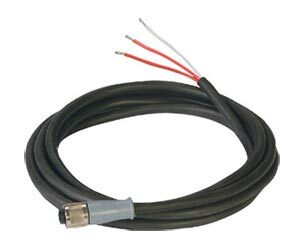 Omega's M8 RTD sensor extension cables are wired to match the wiring used in our PR-23 Molded M8 RTD Sensors. The color code (see wiring diagram) is as specified in the International Standard IEC 60751. Miniature Connectors for RTD's and Thermistors Series "T"